We’d love your help. Let us know what’s wrong with this preview of Shrinking the Cat by Sue Hubbell. To ask other readers questions about Shrinking the Cat, please sign up. What a fine book. The result of a relentless curiosity about the world around us and a keen mind. It seems that Hubbell has built a dream life where she spends much of her time exploring and thinking about the natural world and it is our fortune that she writes so well and is willing to share her observations...about cats, apples and err.. silkworms. Like it or not this is the stuff genetic engineering is made of and Hubbell seeks to reconcile our inner edenic impulses with the seductive razor o What a fine book. The result of a relentless curiosity about the world around us and a keen mind. It seems that Hubbell has built a dream life where she spends much of her time exploring and thinking about the natural world and it is our fortune that she writes so well and is willing to share her observations...about cats, apples and err.. silkworms. Like it or not this is the stuff genetic engineering is made of and Hubbell seeks to reconcile our inner edenic impulses with the seductive razor of wild science. At the very least she brings everyone along the spectrum to the negotiating table, implicating us all mad scientists so that we might better understand what our choices are going into the future. but my favorite part of this book is the lovely stories she tells of silkworms smuggled in the coiffures of princesses and the luxuriant genetic promiscuity of apples. ive always believed in the inherent poetry of science and this book and books like it will be my proof if ever i am called upon to witness. To heck with the cats, they made a rabbit glow in the dark! I read this so hard I almost ate it! This book is not a bestseller, and probably not well known, but it is one that deserves to be. As an author of similar books, like “Waiting for Aphrodite”, Sue Hubbell created this book at a time of controversy, when the talk of genetic engineering was at its highest. This book was written to explain that the concept of genetic engineering is not as harmful as it sounds—we’ve been doing it for thousands of years! “Shrinking the Cat” is a fairly brief text that describes the human, and natural, p This book is not a bestseller, and probably not well known, but it is one that deserves to be. As an author of similar books, like “Waiting for Aphrodite”, Sue Hubbell created this book at a time of controversy, when the talk of genetic engineering was at its highest. This book was written to explain that the concept of genetic engineering is not as harmful as it sounds—we’ve been doing it for thousands of years! “Shrinking the Cat” is a fairly brief text that describes the human, and natural, processes of genetic engineering. By using the histories of corn, silkworms, cats, and apples, Hubbell interestingly tells her audience about this controversial scientific topic and teaches us that genetic engineering is not that harmful, terrifying thing that the media sometimes makes it out to be. Throughout my life, I was never one to read the nonfiction section of the library, and be enthralled with the books I read. But, this book was a pleasant surprise. “Cat” makes reading a scientific topic like genetic engineering more interesting for the average reader, and also simple and easy to understand. Several concepts found in the book, like the founder effect and genetics, are explained more simply than the average nonfiction science-based book. Hubbell’s points are solid and are well supported, so even the staunchest opponent toward processes like genetic engineering would be able to understand her side of the argument. She helps the reader learn that genetic engineering is an ancient process, even if our ancestors didn’t know that’s what it was, and because of that, we wouldn’t have many of the things we have today (like apples) without it. She also tells the history of genetic engineering thoughtfully and without the tone of great formality and speaks to the reader, like a teacher generally would a student. I will admit to say this book will probably not be for everyone. I only say this because I know that some are not that interested in topics such as this and nonfiction is not a topic they generally choose (like myself), but it is definitely worth the read. 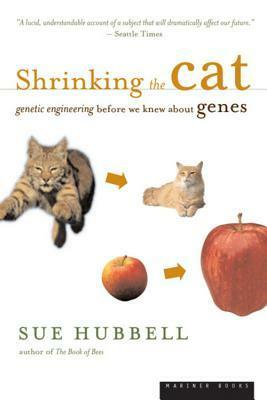 If you are interested in genetics and biology, but yet not that interested in nonfiction works, “Shrinking the Cat” by Sue Hubbell is for you. A collection of long essays on domestication and more modern genetic tinkering on selected species: mainly corn, silkworms, cats, and apples. Not as compulsively readable as Hubbell's other collections of essays, but interesting and thought provoking. She covers some of the same material that Michael Pollan does, and just as well, with a 'further reading' section at the end and a good index. Did you know that cats' brains have shrunk over 10% in the last 1000 years? Hubbell says they're not necessa A collection of long essays on domestication and more modern genetic tinkering on selected species: mainly corn, silkworms, cats, and apples. All in all, a lovely, compact treatise on how homo mutabilis (as she dubs us) interacts with its world. Long before we knew how it worked on the DNA level, people have been manipulating plants and animals--this book explains how we refined silkworms to work for textile producers, made Central Asian trees into the familiar apples and somewhat unsuccessfully domesticated cats. Johnny Appleseed was not who you think he was--the settlers wanted apples for hard cider, not pies, kids. Nicely written and enjoyably breezy, this is a lovely introduction for anyone interested in the genetics of domesticated lifeforms. It's packed with interesting tidbits about how familiar plants and animals came to be, and the ways that humans "fiddle" with everything around them. This is my all time favorite casual science read. If Sue Hubbell could write about every topic like this... I would know about everything. :) I LOVE this book. I used it as a backdrop to teach high school biology students about genetics and they were enthralled. The author makes a fair argument that genetic engineering is nothing new. Humans have breeding and creating hybrids and new breeds since humans first realized they could influence nature but doing the selecting for it. The book is well-researched and well-constructed. A really good book. Hubbell demonstrates that genetic engineering is nothing new - we've been at it since before we could write. A clear voice of reason in amongst all the chatter. Read this for a fresh point of view. Covers four stories of humans tinkering with nature: corn, silkworms, cats, and apples. I liked the history of what's been done, but would have preferred a bit more of her analysis of what it means to continue down this path. Because genetic engineering *is* different from artificial selection. Although this book is interesting, it is very clearly advocating for less regulation of genetically modified organisms in products. By the end, that angle gets a bit tiresome. With all the talk of GMO modified corn and chickens Sue Hubbell examines our role in altering genetically four different species, cats, corn, apples and silkworms. A very good read. An excellent and beautifully-written work, full of interesting and entertaining details. Lots of very good history as well as history of science. Sue Hubbell is a graduate of the Universtiy of Southern California. She received a master's degree in library science from the Drexel Institute of Technology and was a librarian at Brown University. In addition to her books she has written for Time Magazine, Smithsonian Magazine, The New Yorker, the New York Times and the St. Louis Post-Dispatch. She currently resides in Maine.